Welcome to No Fruit Left Behind – an innovative gleaning project hosted by One Island in West Hawaii. Our gleaning teams meet up once a week and head out to a host farm or garden to gather up produce that would otherwise go to waste. So far they’ve beene avocados, mangoes, starfruit, banana, breadfruit, lemons, tangerines, grapefruit, limes, pomelos, coconuts, spinach, lavender, bilimbi, soursop, with more familiar and exotic foods ahead. We’ve topped 3,744 pounds of fruit gleaned from farms and gardens and brought into the local food system since August of 2012. This is food that would otherwise have gone to waste. Over 2,000 pounds has gone out as donations to the community, host farms, and food pantries to feed the hungry. How it Works For every 100 pounds the volunteer crew gleans, 50 pounds goes back out as donations to the farm host, to the local food banks, senior center and the homeless, and the gleaning crew. The other 50 pounds is sold into the local food system through natural foods and grocery stores, restaurants, and at the farmers market as a fundraiser. We have fun fundraiser items – tshirts, tote bags, and value added products too – all aimed at creating a sustainable financial foundation for long term gleaning project services. 1. If you have or know of a farm with a harvest available for donation, the gleaning crew will come gather the food that would otherwise go to waste, can share a portion with the farm or garden, and will help with some orchard or garden clean up projects while doing the glean. 2. If you would like to join the Glean Team, ‘like’ No Fruit Left Behind on Facebook and news about the glean will come to you regularly. There is a need for agile pickers Thursday mornings and, in the afternoon, we need kitchen help sorting, cleaning and preparing the food to go out into the community. We also invite volunteers to lend a hand at the Sunday farmers market. Each activity averages a 3-hour donation of your time to make a valuable impact on reclaiming our local food system. We’d love to have you sign up for once a month volunteer assignments – more if you have time. 3. 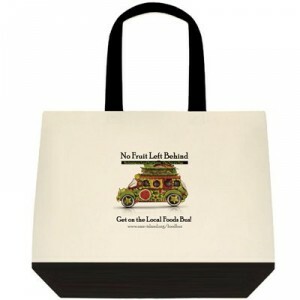 Support No Fruit Left Behind by purchasing a tote bag t-shirt, or value added product. Tool donations are welcomed too!